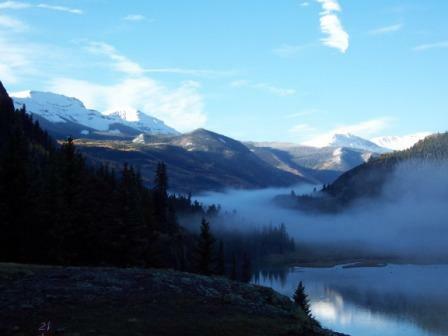 Tailor Made RV Destinations for Fall! Hard to believe we'd never actually gone to Mesa Verde. Heck, we lived just down the road in Aztec, New Mexico for the first three months we were married! Ever notice how little you look at the things right under your nose, or just down the road from home? We did go to the Indian Ruins in Aztec, but never made it up to the National Park ..... Doh! We finally corrected that error and made a visit to the National Park in September of '05. I'd show you the bruises where I was kicking myself .... but that'd get me busted for indecent exposure! Rolling southwest from Fort Collins, headed for Mesa Verde, we took I-70 west from Denver and cut south, off the interstate,...finally!.... I really dislike travelling on interstates! ..... at exit 195, heading toward Leadville. Now there is an area worthy of spending some time in, as an RV Destination of its' own.Truth is, if we'd had more time to make this trip, I would've preferred to stop there for the day. But, we only had a mite over a week for our Mesa Verde trip, so I felt the need to once again violate my daily mileage limit, and roll on southwest. My goal was Lake City, in Hinsdale County. 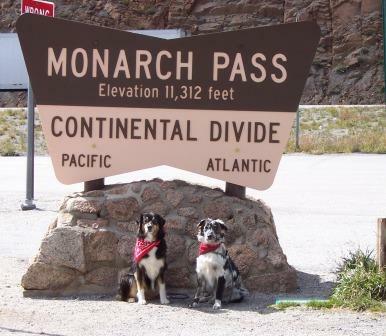 So we rolled on, making the turn west at Salida, onto US 50, and climbing 11,312' Monarch Pass a few miles on down the road. Goin' down the west side of Monarch pass is one of those places a guy really smiles, thinking of the money he spent, puttin' in that Jacobs exhaust brake! Watching everbody else cookin' brake linings, and burning out tail lights, while he actually has to give it some throttle here and there to maintain speed, really makes a guy feel like some sort of RV Boondocking genius! Just west of Gunnison, as you get to Curecanti Nat. Rec area , you'll find Hwy 149, rolling south, into some soul feeding country, on the way to Mesa Verde, by way of Lake City. One thing about Colorado. There's something here for everybody. I can describe most of it as "soul feeding". For me, any sort of Far Country succeeds in releasing the pressure that living in or near a town, seems to build in my chest. We pulled into Lake city, fairly late in the day, with a mild storm brewing. At lower altitude it was rain.We rolled past the little RV Park in Lake City, hoping to find a camp more fitting to our preferred style! Just up the hill, toward Slumgullion Pass we slid over into a pull off to check out the view of Lake San Cristobal. As we were walking back to the truck, in lightly falling snow, to continue the climb, planning on a National Forest Site on down the road another 30 minutes or so, a jeep pulled in and the driver jumped out. He wondered, were we planning on climbing the pass? After being advised that cars and such were sliding all over the mountain, just a mile or so ahead, we agreed with him .... turn back now and wait for the weather to clear in the morning! Sure glad for the advice! That was the only reason he pulled into the pull out too. To warn us. Good People! 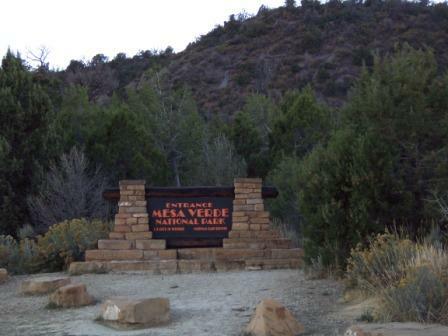 We might not have made it to Mesa Verde, had we kept going right then, up into that slippery pass! 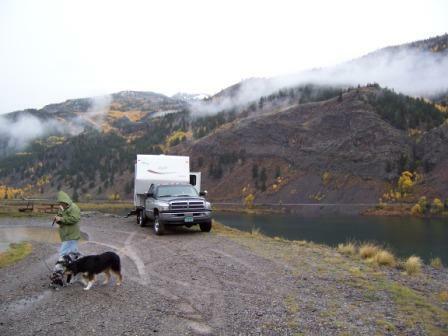 We headed on back toward Lake City, figuring we'd go ahead and use that little RV Park. But, almost there, we saw the road going back into Lake San Cristobal and figured what the heck, it's worth the look. Pretty, Pretty place. I really didn't like the look of that narrow, muddy, road either. Getting trapped in a no turn around situation, on a twisty little mountain trail, nearing dusk was not my idea of shining times. I was ready to just turn around right there, but Heidi jumped out and said ' I'll go check it out", and off she walked. More good fortune! Just out of sight, around the willow shrouded bend, she ran into a fella that had a rig in a county campground, just a little ways up. He assured her there was plenty of room and we could navigate the road without problem. She came ditty boppin back to the truck with a smile on her face. Cool! It was a narrow little potholed road, one lane in spots, that went back in, hooking around to the other side of the lake, but as assured, no problemo. We found a nice spot, in the county campground, where the slide actually hung over the cliff that fell off into the lake! Can you see the slide on the drivers side? There wasn't much under it! Made Heidi a little nervous but I thought it was cool .... that bench was solid granite, so worried I wasn't. Awesome view, let me tell you! The icing on the cake was that, although we could park there, the campground was technically closed for the season! No water, or trash pickup, but no fee collection either! That leaves more $$$ for Mesa Verde! We made a short tour of Lake City, early the next morning, and then continued our journey toward Mesa Verde. Lake City is another place to pencil into your RV Destinations notebook. Pretty, Pretty little town. Seems like a great place to recharge your batteries for a while .... As high as it is, most folks will want to do their recharging in the summer though! If you're a hiker or photographer, La Garita Wilderness is off to the southeast, the Weminuche Wilderness to the south and a 4wd road runs over to Silverton to the southwest. If you can't find some good hiking or photographic opportunities in that country, you're being way too picky! 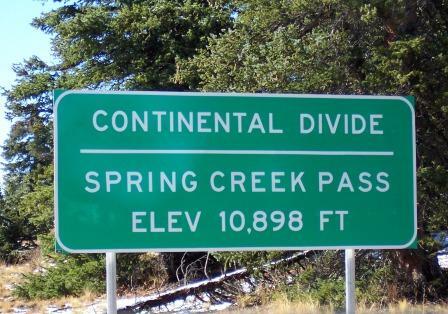 and then Spring Creek Pass, we were glad we had dawdled for a while in town to let the road clear. As it was, the pavement was dry, the sun was shining and the mountains could not have been more beautiful. This is what RV Boondocking was made for! Spent most of this day rolling on easy to Mesa Verde. Made a supply stop at Wally World (wal mart!) in Durango and then it was on to the Cliff Dwellings! You're going to find Mesa Verde sitting in beautiful country. I think it may be in what they call the Chapparal type country. Lots of Junipers, Gambel Oak, Mountain mahogany, and Far Country. You get the idea when you see the names of places, like Far View Lodge and Far View Visitor Center. Mesa Verde is the sort of country I feel pretty much at home in. There's a national forest campground several miles back toward Durango and Mancos State park nearby. 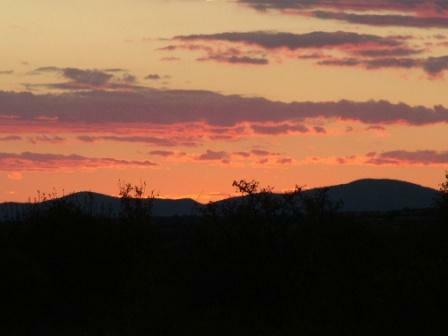 We decided, late in the season as it was, to stay at a site in Mesa Verde National Park itself. Figured the crowds would be manageable. Again, since I have a "Military disability" (boo hoo, poor, poor me) I get a really nice discount on camping/parking fees. As well as free entrance to the park ..... If you have a documented "disability", check out the Golden Access Card with the Park Service or the U.S. Forest Svc. Well worth the minimal effort required! We set up in the Morefield Campground. You'll find widely spaced sites that should fit just about anyone's rig. We pulled in, late in the day, in mid September and the place was more than half empty. My understanding is that it rarely fills up, year round. So, apparently, my foolishness in not getting here long before now in not an isolated occurrence! You'll also find an easily accessible dump station to handle that chore. 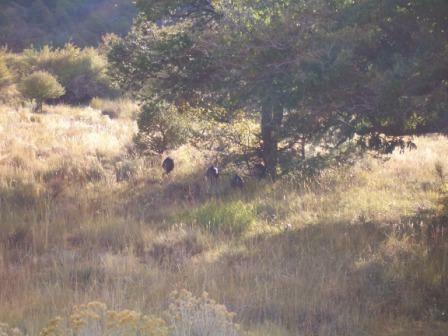 A special treat was the herd of Wild Turkeys that wandered through the campground on a daily basis! I was so busy enjoying just watchin' 'em, that the senile old fool I'm getting to be, almost, forgot to push the button on the camera. I finally remembered long enough to get a weak snapshot of 'em as they were leaving the area one afternoon. I swear, those brown blotches under the tree are the turkeys! ..... This bunch had strolled right by within yards of the rig. Double DOH! All my pics can't be good! If they were ..... that would make 'em all average wouldn't it? We found out the next day that Wetherill Mesa Road had already closed for the season, in early September. At first you think .... "Damn, all this way and half the darn place is closed!" Not to worry. 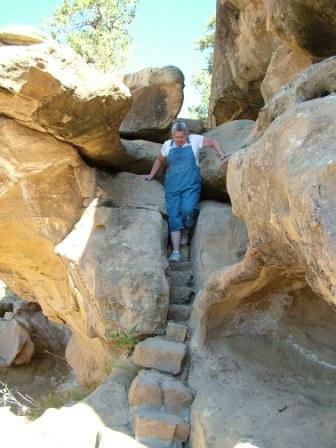 There remains plenty to wear you out hiking and seeing, in the part of Mesa Verde that remains open all year! We were there for several days and still have more than half of the available trails and sites in that "open" half to see for the first time. I know that the parts we did see will be seen again by us, for sure and for certain. Also, that road is restricted to less than 8000 lb. GVW vehicles .... so my old '98 Cummins would have been denied anyway .... and Big Red in the future. We spent our days, for the must part, strolling through Chapin Mesa Museum, Far View Visitor Center and taking the short walks to many of the "Pit Houses" and other nearby archeological sites. You can book tours and get any required access permits to special sites at the Far View Visitor Center inside Mesa Verde National Park. 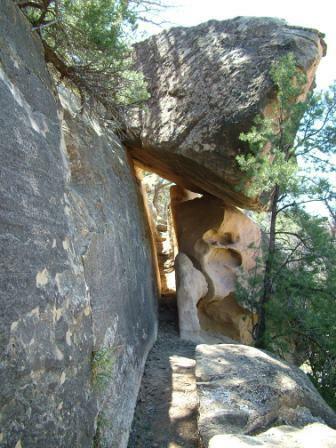 On one fairly warm day, we hiked the 2.8 mile Petroglyph Point trail. A beautiful trail down through a canyon, and then you make a relatively short climb up to the rim and circle back to the trail head. 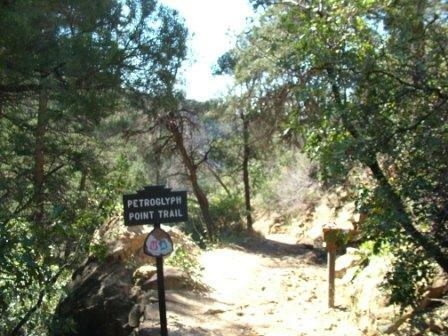 Something to keep in mind about the trails in Mesa Verde. The majority of the trails are a pretty easy stroll. But then, right smack in the middle, you come to these narrow, steep, (up and down) little passages to navigate. Generally, from what I saw, you have plenty of hand holds and such, so you can go safely, if you are in reasonable health. Unfortunately, if you have heart or breathing difficulty, or need to use a wheel chair/walker/cane or some other support to get around, some of the areas are going to be inaccessible to you. Don't get too down though. There remain a goodly number of sites you can get to and see, no matter your disability. Check out the websites and brochures to lead you to those places. And take water! It gets hot and dry, especially in the summer and at this altitude. Drink plenty of water and take it easy. "You'll get a more harmonious outcome!" The construction of these places is pretty amazing. Considering the minimal tools they had to work with, I'm not sure I would've been able to compete with them folks. Think about what it took to carry big old blocks down to the sites, hanging on the face of a cliff! I wouldn't want to climb down there by myself, let alone carrying a 50# stone! Pretty amazing. And, they built something like 600 of these Cliff Dwellings, all of 'em hung on the face of a sheer rock wall! 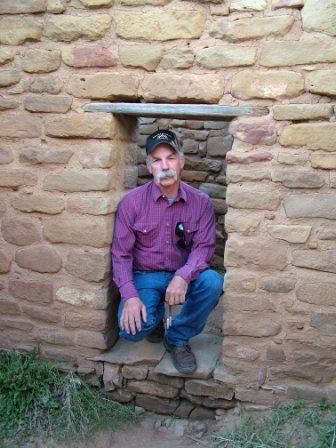 Can you imagine if you just got home from a "Cliff Dwelling Raising"? 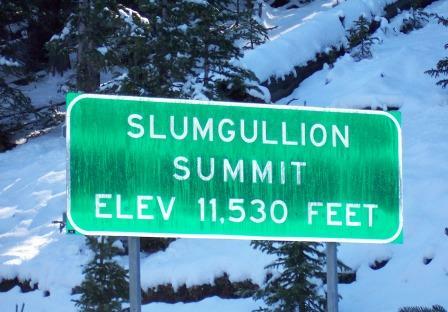 You had a few too many at the construction party and now you have to climb up or down a cliff to go to bed? One slip, one wrong move and eeeeeeeiiiiiiiiiiahhhhhhhhh!!! Makes a guy not feel too bad about having it pretty easy these days! I'll keep my fiver, thank you very much! Something else occurred to me as we toured the Mesa Verde ruins. These weren't real big fellas! Talk about havin' to duck to go through doorways.... And I'm a runt myself! The folks that built Mesa Verde must have been awful darn compact! No obesity difficulty in their world for sure. Diet Coke would've gone broke tryin' to sell to these guys! It's a hard and dirty job, rummaging through ancient ruins at Mesa Verde. But if we don't do it, who will? For all the information on Mesa Verde that you can possibly use, check out this Un-official website to Mesa Verde National Park. Don't wait. 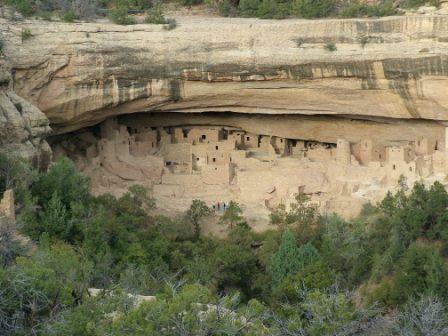 Pencil Mesa Verde into your RV Destinations schedule for this year. Carve out at least several days time, so you can explore it in manageable, comfortable bits. You'll not regret it, I promise!